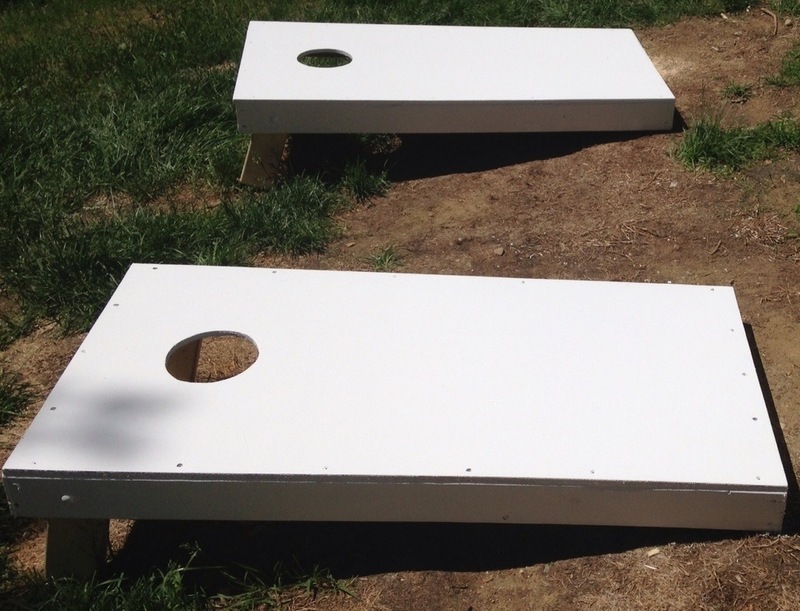 ← Bean Bag Game DIY Part ONE! So you’re done building? But these aren’t very pretty, so tell your handy-man that he’s done building (unless you’re the builder), then put your painting pants on! 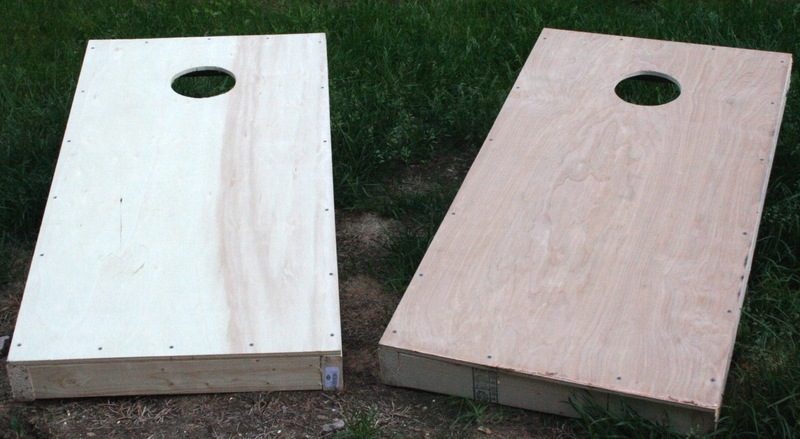 I wanted the boards to be white and I got paint and primer which comes in white. Here is where my lack of knowledge of everything build-y and paint-y comes in because I’m not sure if you can buy paint and prime all in one as a color other than white. If you can, that’s the best deal! 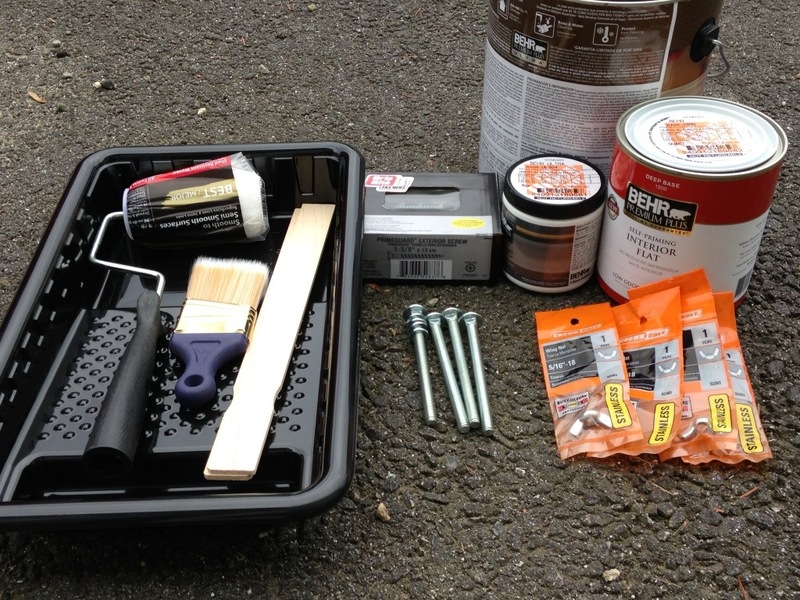 So first you need to paint your boards with primer. Once that is dry you can paint it. Since mine was a combo I did it all at once. I ended up having to do a total of 3 coats to get everything completely white. 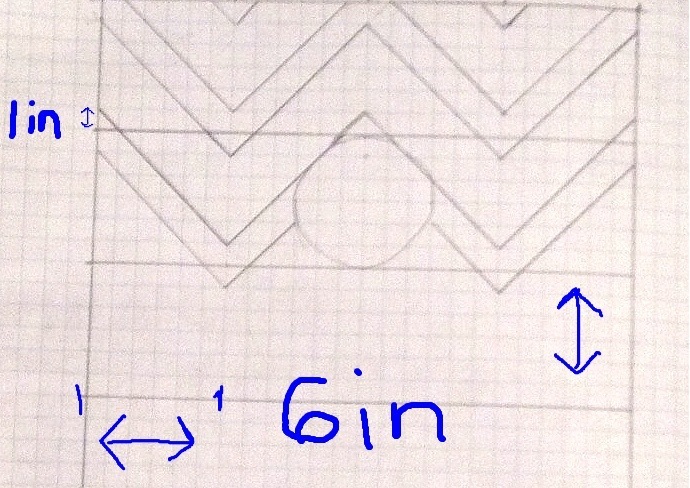 The chevron pattern requires somewhat accurate measurements. Start off by marking off six-inch marks horizontally and vertically. Your lines will never meet your tic marks, they will be drawn an inch above and below your six-inch tic marks. I need to apologize for the lack of pictures to help explain the most complicated part of the painting. I hope the diagram helps with the explanation, as well as the very crude drawings i attempted at 2AM. I, of course, am not one for doing math and making measurements, so I left it up to the hubby-to-be but forgot to ask him to take pictures. 😦 Hopefully my explanation was sufficiently non-complicated. Since I wanted to put our initials on the boards, I traced a really large circle (I admit, it was a frying pan) and left it blank, so it looks like the chevron stripes are behind the circle. 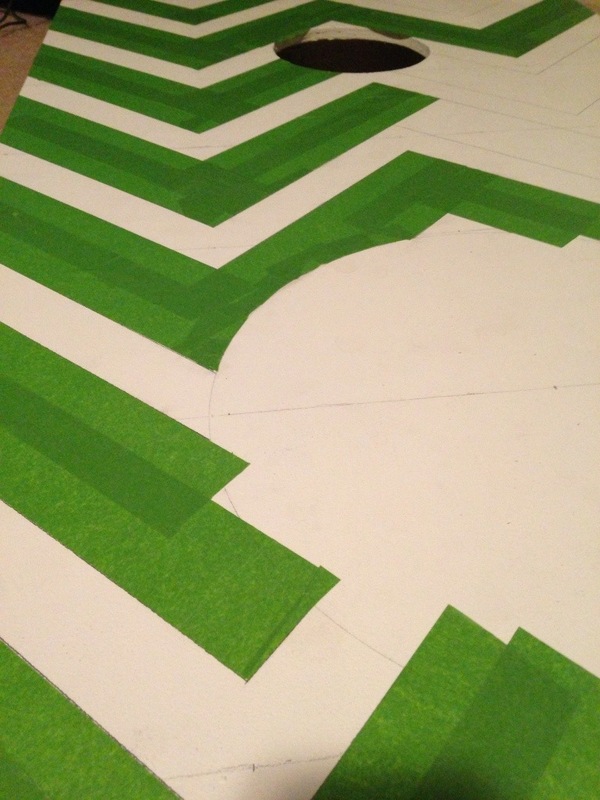 Once your lines are drawn it’s time to tape off the parts you do not want painted. This is completely up to you. I did it both ways. 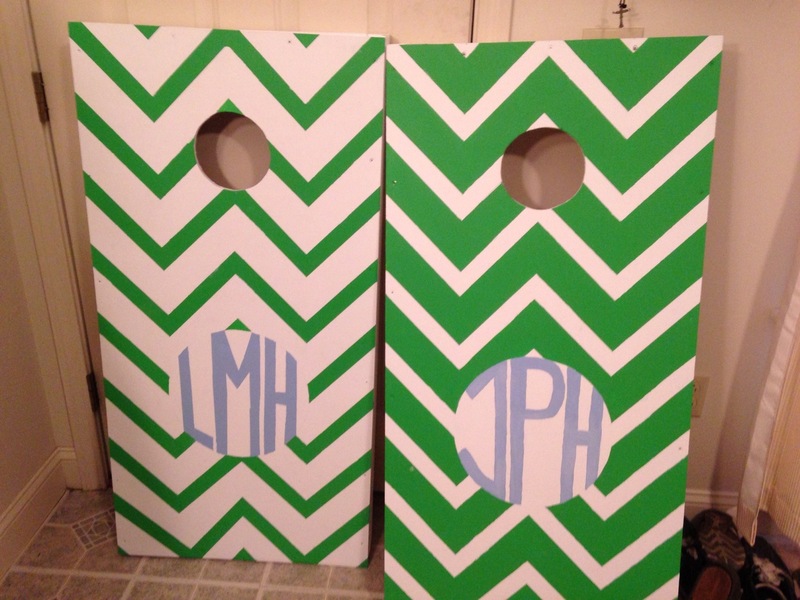 For one board I painted the thin stripes and for the other I painted the thick stripes. Also tape the inside of your circle so no paint gets on the inside of it. Make sure you lay the tape down as smoothly as possible so you have less touch-ups to do. I also did three coats to make sure it was as opaque as possible. Once the paint is all dry, you can remove the tape, and PRESTO! Pretty chevron stripes! There will probably be touch ups to do, just take your tiny brushes and be really careful. I decided I wanted to do our initials in the blank circle, so I mapped out the letters to sort of go inside the circle along the edges. 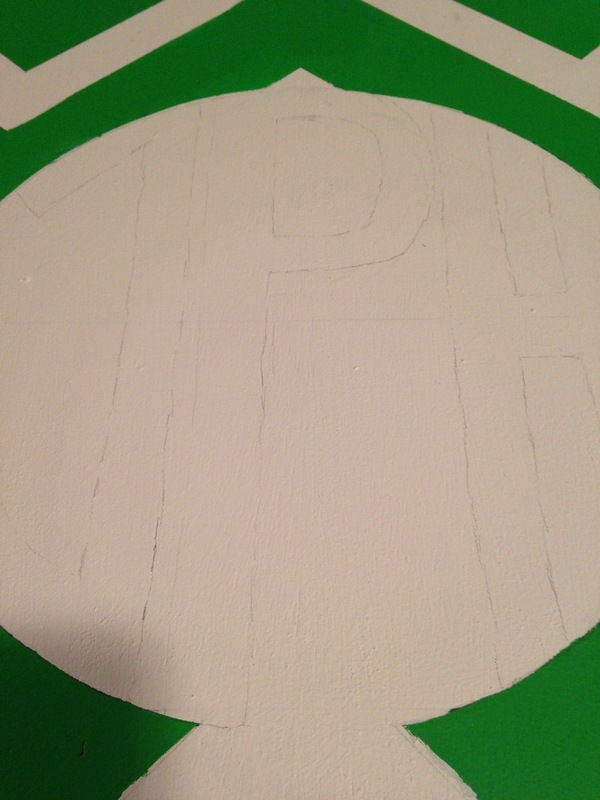 I decided to tape around my initials and paint them that way. 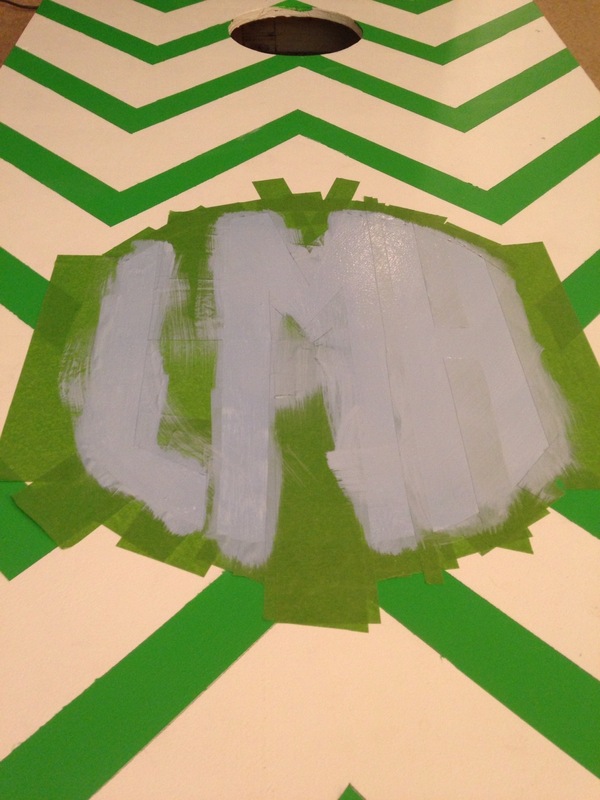 I think the taping was more trouble than it was worth, so for my hubby-to-be’s initials I just free-handed it. I think they both look pretty good! I’m so sorry for the lack of pictures! This was just what I decided to do with my boards, if anyone else makes their own, I’d love to see what you’ve done with yours! Stay tuned for Part 3, there is still one more element to this game that needs doing! To answer your question about 2-in-one primer/paint. Yes, you can have the white tinted to any color you choose. If you buy the 2-in-one primer/paint it saves a little time and effort, since you can skip the priming step. The combo paint costs more than regular paint, but I definitely think it is worth the price. I love the way they came out! The chevron design really makes them pop! Great craft!